Previously I posted about Google Calculator. In that system you are supposed to type your calculation in the Google search box and press enter. The result shows immediately after pressing enter. 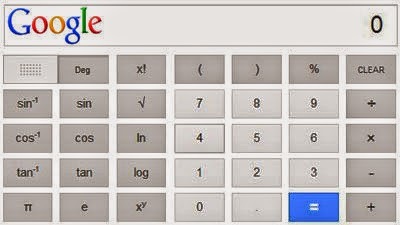 But now it is much easier to use Google as Scientific Calculator. In fact, it is a new sign of innovation by Google. Now you'll get a whole calculator in the home page of Google. And you can calculate just by mouse click. Keyboard is not necessary! To perform your basic or scientific calculation you just need to visit Google. Then type calculator and press enter. You can also visit this page to get the calculator directly. Now you'll see a calculator like below. Now give input by mouse click and press the equal button and have fun!